COMING TO A HABITAT NEAR YOU! The Many Facets of The Endangered Species Act, by Julie Smithson, posted to KBC 9/7/05. This well-researched document details getting species listed, methods used, United Nations ESA mandate, examples, species recovery success rate, etc. A must-read for the objective student of environmental science. Emails about the book The Great Salmon Hoax by James Buchal have been circulating in the midst of Klamath dam destruction schemes. Dams, mismanagement, Endangered Species Act, ..."This book is written to begin debunking these myths and provide a comprehensive summary of the best available scientific evidence on the prospects for salmon recovery. It also tells the many stories of how these myths arose, who is promoting them, and how the promoters have overcome both science and law. Myth #1: Columbia Basin Salmon Are in Danger of Extinction." The Endangered Species Act Fundamental Flaws, by Senator Doug Whitsett 12/12/11. "...These provisions have allowed the intent, implementation and outcomes of the Act to be hijacked to serve the greed and exploitation of preservationist factions both inside and outside of government agencies...In spite of the expenditure of billions of tax dollars, the species recovery rate is less than 1.5 percent." Saving the sucker species, Summit with Senator Merkley, H&N 11/18/18. "There are about 50,000 Lost River sucker left in Upper Klamath Lake..."
Record number of suckers recovered. Biologists find 732 juvenile suckers near A Canal screen, H&N 12/18/15. "...biologists with the Bureau of Reclamation (BOR) found the largest number of juvenile Lost River and shortnose suckers since fish salvage operations began in the Klamath Project in the late 1990s." Lower Klamath Refuge construction an effort to save salmon (on the Columbia River). Habitat restoration aimed at dispersing (baby-fish-eating) Caspian Tern populations, H&N 2/14/18. "...According to Beckstrand, the Caspian tern population along the Columbia River has been responsible for around 15 million to 20 million salmon smolts being eaten annually. The cormorant population growing on East Sand Island is estimated to be responsible for an additional 11 million young salmon each year..."
Environmental, fishing groups sue Oregon over coho salmon, Statesman Journal 6/13/18. "...Poor logging practices by the Oregon Department of Forestry is causing real harm to the Oregon coast coho and commercial fishing families who depend on these magnificent fish for their livelihoods," Glen Spain (PCFFA/IFR attorney) said, the northwest regional director for the Pacific Coast Federation of Fishermen's Associations and the Institute of Fisheries Resources, both plaintiffs in the case..."
"Rather than seek out yet another unrelated non-profit to funnel the money through, PCFFA created a new organization..." IFR / Institute for Fisheries Resources. KBC NOTE: That link directs you to PCFFA/IFR page detailing their many Earthjustice (partially funded by George Soros) lawsuits against Klamath Irrigators in the takings case, power rate case, shutting down suction dredge mining, Klamath River water quality TMDL's, essentially against timber harvest, farming, mining and river dams. Groups seek protection for unique Oregon salamander, The Oregonian 3/13/18. Study blames pot farms for poisoning of threatened owls, H&N 1/12/18. "...Researchers from the University of California, Davis, and the California Academy of Sciences tested 10 northern spotted owls found dead in the region. Seven of the owls tested positive for rat poison, used by pot farmers to keep rodents away from their irrigation systems and crops..."
Spotted owl controversy renews over logging plan, KCBY News 6/12/07. "The Bush administration Tuesday proposed cutting 1.5 million acres from Northwest forests considered critical to the survival of the northern spotted owl, reopening the 1990s battle between timber production and wildlife habitat on public lands..."
Environmentalists sue for more rules to protect sage grouse, H&N 2/26/16. Birds play role in sucker numbers, H&N 1/29/16. “ 'Predation rates on suckers at Clear Lake were highest by birds nesting at the lake...The predation on suckers in 2014 and 2015 pretty much came from whatever got to nest on Last Chance Island,' Hewitt said." KBC NOTE: Historically Clear Lake was a meadow. When The Klamath Reclamation Project was built, it stored some water in that meadow and was named Clear Lake. The federal government took the reservoir and named it a bird refuge, nurturing pelicans and cornerants, keeping out people, and mandating certain amounts of "endangered" suckers that never before lived in that meadow. Now the cormorants and pelicans are eating the suckers, keeping them endangered in that former meadow." *Thousands of fish-eating Cormorants eating baby suckers? by Oregon Senator Doug Whitsett 6/13/13 Newsletter: "What is NOT commonly known is that the second largest nesting colony of Double Crested Cormorants in the Western United States and Canada is located on Upper Klamath Lake. There may be as many as six thousand breeding pairs of these birds reproducing in the Upper Klamath Basin...When will the biologists look to see if the immense population of Double Crested Cormorants living in the Upper Klamath Basin may be simply eating the young endangered suckers?" Reclamation Announces Increased Numbers of Lost River and Shortnose Sucker Fish in the Klamath Project, BOR 12/17/15. "Bureau of Reclamation biologists found the largest number of juvenile Lost River and shortnose sucker fish since fish salvage operations began on the Klamath Project...the late 1990s"
Swimming upstream: Biologists monitor endangered suckers, H&N 11/27/15. "...scientists have tagged roughly 30,000 Lost River and shortnose suckers." Judge clears barred owl removal study, Capital Press July 21, 2015. "Populations of the northern spotted owl, which is protected under the Endangered Species Act, have continued to decline in recent decades despite strict limits on logging...U.S. Fish and Wildlife Service authorized an experiment to remove 3,600 barred owls over four years, typically by shooting them, to see if spotted owl recovery improves...the barred owl has consistently invaded the spotted owl’s territory since the 1970s...the removal study costs $1 million a year"
(Klamath) Project irrigators could get new fed status. ‘Applicant status’ may allow for more input in ESA development, H&N 7/18/15. "The amendment was proposed by by U.S. Reps. Greg Walden, ROre., and Doug LaMalfa, R-Calif., to help protect Klamath Project water users in Oregon and California...the amendment gives Project water users “applicant status,” ensuring they are included in Endangered Species Act (ESA) consultations that affect Project water operations." Tracking suckers in drought proves to be a tricky task. Spawning data hard to come by in low water, H&N 5/21/15. "75 Clear Lake suckers received telemetry tags, more than 10,000 have been fitted with another type of tag..." KBC NOTE: Clear Lake was historically a meadow. When Reclamation rerouted water to create farmland, they put water in the meadow to evaporate. Our government has made it into a bird refuge with a mandate of how many suckers must exist, thus restricting stored water use for farms. *Oregon Senator Doug Whitsett 6/13/13 Newsletter: Thousands of fish-eating Cormorants eating baby suckers? "What is NOT commonly known is that the second largest nesting colony of Double Crested Cormorants in the Western United States and Canada is located on Upper Klamath Lake. There may be as many as six thousand breeding pairs of these birds reproducing in the Upper Klamath Basin...When will the biologists look to see if the immense population of Double Crested Cormorants living in the Upper Klamath Basin may be simply eating the young endangered suckers?" Preservation plan unveiled for sage grouse. Proposal could affect 10 states, oil and natural gas development, H&N 5/29/15 followed by Interior proposes land controls to preserve Nevada sage grouse, Las Vegas Review Journal. “The economic impact of sage-grouse restrictions on just the oil and natural gas industry will be between 9,170 and 18,250 jobs and $2.4 billion to $4.8 billion of annual economic impact across Colorado, Montana, Utah and Wyoming,”..."Department of Interior is updating management plans covering 165 million acres — an area the size of Texas — in consideration of the sage grouse"
Washington ranchers wary of (sage) grouse agreement, Capital Press 5/5/15. "Creston, Wash., rancher Dawn Nelson says she would have to reduce her herd of more than 120 by roughly half if she were to sign up...They say it’s voluntary to sign up, but if you don’t sign up and you happen to have a bird die on your place or an accidental take, they can come back and sue you,' Nelson said." $4 million for wildfire strategy -Sage Grouse Habitat , H&N, posted to KBC 5/7/15. Feds spend $236M to help landowners protect grouse, H&N 5/1/14. Tribes in 13 States Receive $4.2 Million From Service for Conservation Work, FWS 3/27/15. California and Southern Oregon Tribes Awarded Grants. "Tribal lands encompass millions of acres of important habitat for hundreds of wildlife species across the nation...Since its inception in 2003, the competitive Tribal Wildlife Grants program has awarded more than $68 million to Native American tribes, providing support for more than 400 conservation projects...Yurok Tribe ($176,771)...This project will support specific goals of the California Condor Recovery Plan. The Klamath Tribes ($200,000) The Re-introducing Extinct Populations of Endangered Suckers in the Upper Klamath Basin grant will assess and restore spawning habitat for endangered Lost River and shortnose suckers in Upper Klamath Lake Oregon." Biologists identify pot gardens as salmon threat, KATU 9/30/14. "The plan marks the second time that Endangered Species Act actions have pointed to marijuana as a threat. The U.S. Fish and Wildlife Service has been looking at rat poison left around illegal pot plantations in California as a factor in whether to list the Pacific fisher as a threatened species." Go HERE for numerous articles on huge pot plantations near the Klamath River, on the Hoopa Indian reservation, in our locked-up forests. $3.5 million to hunt the barred owl that killed the spotted owl, H&N Forum 1/24/14. Sage grouse plan seeking comments by Jan. 13, H&N 1/2/14. "The draft EIS has six possible management alternatives for maintaining and increasing habitat for greater sage grouse on BLM lands in Oregon. The BLM has about 10 million acres in Oregon that provides greater sage grouse habitat." Feds begin barred owl kills to help spotted owl, H&N, 12/21/13. "Major cutbacks in logging in old growth forest that spotted owls prefer as habitat have not turned around their population decline, and scientists want to see if removing competition from the more aggressive barred owl will make a difference." Officials oppose Oregon spotted frog habitat; all three commissioners voted to send an opposition letter to USFW, H&N, 12/7/13. "Klamath County commissioners are voicing their opposition to designating more than 56,000 acres in Oregon as critical habitat for the Oregon spotted frog, which the U.S. Fish and Wildlife Service is proposing to list as a threatened species...of the 53,866 acres in Oregon considered for critical habitat, 27,825 are in Klamath County and 8,823 acres in Klamath County are on private land." Spotted Frog Protection; Endangered listing could have impact on Basin; some say ruling would be positive; others disagree, H&N, posted toKBC 9/1/13. "The U.S. Fish and Wildlife Service announced Wednesday a one-year period to assess whether to designate the Oregon spotted frog as threatened, and whether 68,192 acres and 23 stream miles should be listed as critical habitat throughout Washington and Oregon." Feds to start shooting barred owls, The Westerner 7/24/13. "The U.S. Fish and Wildlife Service on Tuesday released a final environmental review of an experiment to see if killing barred owls will allow northern spotted owls to reclaim territory they’ve been driven out of over the past half-century." PRESS RELEASE - Members Launch Endangered Species Act Working Group, House Natural Resources Committee, posted to KBC 5/11/13. Ranchers wary of rules expanding scope of ESA, Capital Press 3/27/13. "cattle can be subject to greater restrictions on grazing near streams that are considered critical habitat even if no endangered or threatened fish swim in them, said Budd-Falen..."
Timber industry challenges spotted owl habitat, Capital Press 3/22/13. Department of Interior Federal Register: over 2 million acres proposed critical habitat for yellow legged frog and Yosemite toad, 1,105,400 acres. 750,926 acres in Yosemite: Part 2 Part 3 Public Comments due June 24, 2013. Mining and timber country..."Butte, Plumas, Lassen, Sierra, Nevada, Placer, El Dorado, Amador, Calaveras, Alpine, Mariposa, Mono, Madera, Tuolumne, Fresno, and Inyo Counties, California"
Feds to cut property rights under Endangered Species Act! PLF blog, posted to KBC 10/27/12. Humboldt: Federal charges against former Yurok forestry director over $1 million embezzlement, The Times-Standard, posted to KBC 8/15/12. "Raymond, LeValley and McAllister used an elaborate system of fake invoices, false purchase requests and electronic bank transfers to embezzle more than $870,000 in federal funds from the Yurok Tribe during a three year period of wildlife preservations studies... The surveys that allegedly were never conducted primarily purported to be for spotted owl research..."
There is local timber that could be cut, Bob Jensen, H&N, posted to KBC 4/15/12. "The 1990 Timber Management Plan for the Fremont-Winema National Forests called for a timber harvest of approximately 490 million board feet...this volume was never met due to legal challenges to various timber sales because of spotted owl and salmon controversies, so that today the two national forests produce approximately 50 to 60 million board feet annually." Ocean anglers get long salmon season; In Brookings, Gold Beach area it runs May 1 through Sept. 9, Mail Tribune 4/7/12. "The liberal seasons are possible because more than 1.6 million chinook are estimated to be headed toward Northern California's Klamath River, the highest number in more than 30 years." Cliff Wooten, former Lin County Commissioner and former resident of Tulelake, Calif. "With the problems of the "poor" management of the irrigation water (trying to save the "sucker" fish at Klamath Lake) the future of Tulelake farming is in jeopardy. I might add the entire lake was poisoned back in the mid 60's to kill all the sucker fish and now the same irresponsible government agencies are trying to "save" this fish which was destroying habitat of other fish. I can't count all the rowboat loads of dead suckerfish that was removed from Klamath Lake at Moore Park. The dead fished floated up and the wind "stacked" them at the park and I remember working for the Klamath Park Department "scooping up" these fish and our boats were dragged ashore and the dead fish loaded in County trucks and hauled away as fertilizer." AUDIO - Attorney Karen Budd-Falen interviewed by Kirk McKinzie about Equal Access to Justice Act / EAJA, "The ESA does not require the agency to know how many species there are before it's listed...What the Obama administration is proposing is, let's include critical habitat in places where the species may feel like living someday..." Karen explains how the federal government reimburses environmental groups and litigants like Earthjustice and Center for Biological Diversity for attorney fees suing the federal government, however individuals or small groups rarely are reimbursed when trying to save their farms or property. The government does not account for how much money it gives these groups for fees. Federal Management of Oregon's Forest Lands, Senator Doug Whitsett Newsletter 8/12/11. "federal district court ruled that the owl was threatened under the Endangered Species Act and that nearly unlimited critical habitat was required to preserve the bird from extinction...Oregon’s annual timber harvest from federal lands plummeted from 60 percent to 12 percent. Nearly 300 timber mills closed and more than 30,000 family wage jobs were lost." Little hope in delisting endangered sucker, by Warren Haught, Klamath Falls 7/22/11. "Our local 11.8 percent unemployment rate is in large part due to the ESA." Wildfires threaten protected habitats; wolves, owls among the endangered, H&N, posted to KBC 7/7/11. "Crown fires in overgrown forests have become the greatest cause of unusual losses for the (spotted owl) birds, and 73 protected nesting areas were burned in the fire,...The burned forest supports more than a dozen other endangered or threatened species, including snails, frogs and fish. Dozens of other species live in the forest that aren’t rare, including bear, deer, antelope and a herd of elk that, at about 6,000, is among the state’s biggest." More letters and research by James Waddell HERE. Tag, you’re it Biologists tagging endangered suckers in Lake Ewauna, H&N 4/5/11. "The initial reason (for tagging) was to find out how many there are...”The estimated few thousand suckers are ... not large enough to potentially push the fish off the endangered species list." Water, sucker science argued at conference, H&N 2/4/04, "(William Lewis, chair of the National Research Council committee) said ...the finding that water levels in Upper Klamath Lake aren't as important for suckers as previously thought, ...(the NRC) found that lake levels aren't a "master control" for larval suckers, Lewis said." MORE on William Lewis and lakes levels for suckers at 2004 science conference. David A Vogel, Fisheries Scientist written testimony about endangered suckers (KBC NOTE: Vogel says there were 10's of thousands more suckers than estimated when they were listed as endangered, however gov't agencies won't allow them to be delisted.) July 17, 2004. HERE for Klamath ESA DVD, sectioned film of the 2004 hearing and rally. Another town needs help. Please watch this 20 minute video. We lived this in 2001 when our water was shut off, and other Klamath Basin farmers lived a water shutoff this year. People with water rights signed by the President of the U.S.A. 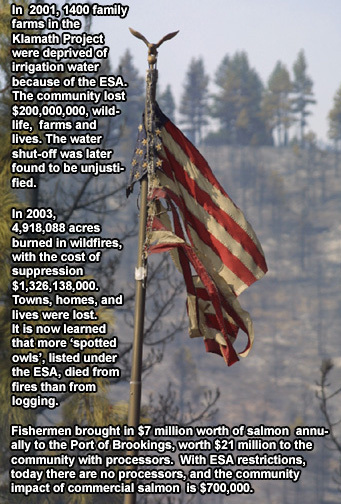 Thanks Awaker on our Discussion Forum for finding this sad story told by Americans on the East Coast being destroyed by environmental groups and the same government agencies. KBC NOTE: "In 1986 the U. S. Fish and Wildlife Service staff responsible for whether or not to pursue these (ESA) listings believed there were only 12,000 Lost River suckers in Upper Klamath Lake...they didn't believe they were endangered. A couple years later...we now know for a fact that number's exceeded by tens of thousands of Lost River suckers. Now they flip flop and say they are endangered. What constitutes endangered? David Vogel, fisheries scientist with 29 years experience, 14 years working for the Fish and Wildlife Service." Sucker holds significance for tribes, H&N, posted to KBC 9/17/09. KBC COMMENT: According to Klamath Basin Restoration Agreement advocates, power ratepayers and taxpayers must pay millions/billions$ to decimate four Klamath River dams because salmon must come into the Klamath Basin and beyond because they supposedly provided food for the Indians. In this article, tribal biologist said the indians staple was suckers; they would have starved without suckers. What was it, suckers or salmon? Feds: fish still endangered, H&N 6/27/09. "The U.S. Fish and Wildlife Service delivered a blow to Klamath Basin irrigators Friday when it said the Lost River and shortnosed suckers still belong on the endangered species list." Calif. Central Valley - People or fish: Who gets water under ESA? by M. David Stirling, Guest comment 5/7/09, Capital Press. Advocate: Watch your water rights, Capital Press 11/24/08. "Right now the Supreme Court has made the determination that we are going to protect species at any cost. ... It won't make a difference if 25 million people in Southern California are without water." Comments due by Sept 15 regarding ESA proposal. Send comments by September 15, 2008 to ensure their full consideration in the final decision on this proposal. Revised Critical Habitat Designated for Northern Spotted Owl, FWS 8/12/08. "This includes the designation of approximately 1.8 million acres in Washington, 2.3 million acres in Oregon and 1.2 million acres in California." Sucker revision under way, H&N, posted 6/20/08. "...an appointed group of stakeholders, meetings and consultation from Desert Research Institute researchers will guide the revisions...A fisheries biologist from the Klamath Tribes, the Nature Conservancy and individuals from Oregon State University and the U.S. Geological Survey will participate as stakeholders...Commissioner Bill Brown was concerned to not see a representative from the irrigation community in the stakeholder group and asked if that could be changed. Buettner said the group was established by regional director Steve Thompson..."
U.S. Supreme Court to Decide Whether ESA Listing Exceeds Federal Power, Environmental News, 4/1/08 issue. When Man Is Endangered, Investor's Business Daily 10/23/2007. "That would be the 1973 Endangered Species Act. It's the same law that cut off an irrigation project earlier this decade along the California-Oregon border that 1,400 farmers were counting on." The Endangered Species Act Out of Control, by John R. Lott Jr. and Sonya D. Jones September 04, 2007. "...does it really matter if a fish’s ancestors are from a hatchery or are naturally spawned? As it is, many so-called "wild" or naturally spawned salmon were all but gone and brought back through the use of hatcheries. Given that hatcheries have been around for over a hundred years, it's likely that all naturally spawned salmon have at least some hatchery-spawned ancestors." Bald Eagle to be Removed from Endangered Species List, American Bird Conservancy 6/27/07. Water crisis looms for Westlands farmers, posted 6/15/07, Capital Press. Delta pumps halted; If shutdown is long, agencies may order conservation or rationing, Sacramento Bee, 6/1/07. "Jennings said his group planned next week to seek a restraining order against state pumping operations to protect the smelt." Fish threatened with extinction shuts Delta water pumps, Sacramento Bee 5/31/07. "State water officials Thursday morning stopped exporting water from the Sacramento-San Joaquin Delta to protect the threatened Delta smelt, a tiny native fish that appears to be on the brink of extinction... The Delta supplies 23 million Californians with a portion of their drinking water, as well as to 5 million acres of farmland." Reps. Young & Sali's Statements from Today's Hearing, "ESA Implementation: Science or Politics", posted 5/10/07. Turning off the flow, Modesto Bee 4/17/07. "Millions of Californians would lose at least a portion of their water supply and 750,000 acres of productive Central Valley farmland would dry up if the state cannot satisfy an Alameda County judge...Water flowing down the aqueduct has transformed California's once dry and barren interior into an agribusiness powerhouse that pumps an estimated $300 billion into the state's economy." More ESA Today go HERE. No real guidelines for listing or delisting. Policy Experts Reject Proposal to List Polar Bears as Threatened, Environmental News, posted 1/27/07. "According to the World Wildlife Fund, about 22,000 polar bears exist worldwide in 20 distinct populations. The group acknowledges on its Web site that "the species is not currently endangered," but it expresses concern that the bears' "future is far from certain" because the bears are not protected "against the biggest man-made threat to their survival: global warming." A million here; a million there, Mountain States Legal Foundation, 11/29/06 "Thus, a win-win proposal, which would have generated more than enough water for the species, created jobs and revenues, preserved forest health, and secured local economics, at no additional cost, was rejected. In its place is a multi-million dollar scheme that creates losers all around, beginning with those ranchers in Colorado and Wyoming." Designation of Critical Habitat for the Contiguous United States Distinct Population Segment of the Canada Lynx, FWS: "1,841 square miles fall within the boundaries of the critical habitat designation, in three units in the States of Minnesota, Montana, and Washington." Notice of Availability of an Environmental Assessment and Receipt of an Application for an Incidental Take Permit for the Oakmont Industrial Group Development, City of Ontario, San Bernardino County, CA, Nov 30, 2006, for Delhi Sands flower-loving fly. Rachel Thomas: "Back about 10-12 years ago this same little fly cost about $3 million and a delay of about 3 years in the building of a hospital facility. It almost caused the closure of Interstate 10 at one time." Revised Critical Habitat for the Tidewater Goby (Eucyclogobius newberryi), FWS 11/28/06 "We are proposing to revise the critical habitat for the tidewater goby to a total of approximately 10,003 acres (ac) (4,050 hectares (ha)). This is an increase of approximately 8,422 ac (3,408 ha)..."
San Francisco Bay area: PG&E intends to request a permit to cover 66 species federally listed as threatened or endangered and 23 unlisted species that may become listed during the term of the permit, posted 11/25/06. Designation of Critical Habitat for the Contiguous United States Distinct Population Segment of the Canada Lynx, USFWS release 11/9/06. Sucker fish return in droves, Herald and News 11/2/06, "In August, the Klamath Project's A-Canal fish screen and bypass facility at the southern part of the lake recorded 4,000 juvenile suckers per hour entering the lake. About 50 per hour were counted in 2004." ESA Commentary Lompoc Record 9/15/06, "The way the feds figure, over 4 million acres of land in California alone is necessary to ensure the survival of the red-legged frog." Re August 22nd U.S. Department of Interior “Listening Session” at Deschutes County Fairgrounds in Redmond, Oregon, by Senator Doug Whitsett, Oregon District 28, August 27, 2006. " Our forests are burning out of control, our coastal salmon fishery has crashed, and the Biological opinions that the National Academy of Sciences discovered were not based on accurate and reproducible science five years ago continue to be enforced in the Klamath Basin with catastrophic economic and cultural consequences...Unfortunately, the print media coverage of the event was virtually non-existent." ESA Transparency Bill 4857 6/21/06. ESA Bill 4857: Give consumers the right to know how much the endangered species act is costing them, 6/21/06. Commentary: Forestry may hold key to spotted owl's existence, CFBF 6/14/06. ACTION ALERT: Game Wardens are in Trouble – you can help, Endangered Species and Homeland Security are not protected Klamath Courier, posted to KBC 6/13/06 WRITE OR EMAIL BY JUNE 15TH! Silent Springs, by Rudy Hiley, June 1, 2006. "It really struck me when we got out of the car at my folk’s place; the mill sounds were all but gone...No, there hadn’t been a plague, or a title wave, or a war, it wasn’t a holiday, there were no celebrity visitors in town; the simple fact was that a vital industry had been flattened by a bird; a Spotted Owl...regardless of whether or not the bird was really endangered..."
Species on endangered list challenged, USA Today, posted to KBC 6/1/06. Finally, a habitat even a frog can live with, Inside Bay Area 4/29/06 "At one point during a 10-year bureaucratic and legal battle, the U.S. Fish and Wildlife Service designated more than 4.1 million acres as critical habitat for the frogs. That 2001 fabrication would have created a barrier to further development in almost all of the greater Bay Area. But this month, Fish and Wildlife decided to impose restrictions on 450,000 acres in 20 counties that biologists consider critical to the frogs' survival and recovery." Of Mice and Men, Wall Street Journal, 3/23/06 "31,000 acres of local government and privately owned land in the state and stretching into Wyoming--an area larger than the District of Columbia--was essentially quarantined from all development so as not to disrupt the mouse's natural habitat. Even the Fish and Wildlife Service concedes that the cost to these land owners could reach $183 million." "It turns out that not only is the mouse not endangered, but it isn't even a unique species." More on ESA price tags, go HERE. ESA TODAY Doubts cast on superstar woodpecker's return, New Scientist 3/13/06. "The apparent rediscovery of the ivory-billed woodpecker in 2005 – hailed as one of the great conservation triumphs of recent times – may be merely a case of mistaken identity....the US government moved quickly to appoint a recovery team and commit more than $10 million to try to rescue the species.....The problem is that the video – still the best evidence of the woodpecker's existence – contains no more than a blurry, four-and-a-half-second glimpse of a distant bird as it takes off from a tree and flies away into the forest." NOAA does not list coho, Pressure by Grange aids decision, Pioneer Press posted to KBC 1/27/06. " 'NOAA is still ignoring the court’s decision on the Southern Oregon and Northern California coho, so they are still breaking the law,' said Bergeron." Endangered species controversy rages on the Klamath River, Indian Country posted to KBC 11/15/05. "Many, including environmentalists, are confident that Klamath Chinook will be listed in the near future." A Study Shows Cattle Grazing May Help Endangered Species, All Headline News posted 10/15/05. National Water Resources Association newsletter for 9/23/05. Includes Secretary Norton's additional funding for more wetlands, and ESA updates. Conservationists seek protection of rare salamanders, Center For Biological Diversity 8/23/05. "Wildlife advocates want to extend endangered species safety net to imperiled salamanders in Southern Oregon and Northern California"
Letter to the Oregonian editor regarding Pombo and ESA improvement, by Arlene Kovach, Oregon Women for Agricujlture 8/22/05 "The Endangered Species Act only has less than a 1% success rate in 30 years, while costing farmers, ranchers and other businesses (and ultimately, you) billions of dollars trying to comply with nonsensical rules." ESA Has Always Been About Land Use Control, Not Species Aid, Livestock Weekly 8/1/05. OTHER PLACES: Lewis County, OR - Federal judge has bilked ratepayers with ruling on fish, posted to KBC 7/24/05. "Redden is playing their (the environmentalists') game in the face of solid science that spilling under current conditions is worse for salmon, not better." News from South Dakota Secretary Larry Gabriel on the ESA, posted 7/18/05 Does the king have clothes? Pombo's draft ESA bill, pdf file, obtained from Center for Biological Diversity press release 7/8/05. PRESS RELEASE: ESA Compliance: Limiting Water Supplies and Driving Up Costs? Water & Power Subcommittee to hold hearing 6/21/05. TESTIMONY June 22 Subcommittee on Water and Power agenda, including Dan Keppen, Family Farm Alliance and Russell Brooks, Pacific Legal Foundation. Testimony of Dan Keppen for House Resource Committee, on Environmental Regulations regarding the Klamath Basin and the ESA. Reality vs rhetoric, Save Our Species Alliance response to Eugene Register-Guard, posted to KBC 6/14/05 regarding Congressman Pombo and improving the ESA. HERE is the explanation of the response. Both are pdf files. Mississippi ESA field hearing report, 5/18/05. Appeals court rules plaintiffs must prove harm to invoke Endangered Species Act, Capital Press posted to KBC 5/1/05. Pombo fires back at critics report on species act, Lodi News, posted to KBC 4/30/05. ESA Report to the Chairman, Committee on Resources, House of Representatives by the General Accountability Office, April 2005, pdf. GAO recommends that Fish and Wildlife Service keep track of where their funds go toward endangered species. This is an interesting document. Congressman Richard Pombo Commentary: 'ESA has a zero percent rate of success', AgAlert California Farm Bureau 4/6/05. Agency proposes to list southern green sturgeon as threatened, Mercury News 4/6/05. Endangered Species Act: 30 years of Endangering People and Animals is Enough! conservativevoice.com posted to KBC 3/22/05. SOSS explains water issues, posted to KBC 3/1/05, Pioneer Press by Liz Bowen. PRESS RELEASE: New Approach to endangered species, Pombo, Walden, Crapo, and Chafee announce House-Senate partnership, Congressman Walden's office 2/10/05. Group making a point with 'endangered' snakehead, hometownannapolis.com 1/26/05 "We don't know what the problems with snakeheads will be and we don't want to use the Chesapeake Bay watershed as an experimental tank to find out," said Jonathan McKnight, associate director of habitat conservation for the DNR." Oregon State University--The Daily Barometer, An Endangered Act 1/21/05, followed by KBC Commentary, which has been posted to the Daily Barometer. Where oh where are these 'educated' people coming up with their ideas?? Endangered Humans, Investor's Business Daily, 1/20/05. "Environment: A judge has ruled that coho salmon have been illegally listed as an endangered species, a victory that comes too late for the farmers of the Klamath River Basin and the families of four young firefighters." Media attack proponents of strengthening the Endangered Species Act, Gretchen Randall 1/20/05, Issue Alert from Winningreen -- great myths and facts! Governor Owens pleased with ESA summit, NWRA news 1/11/05. The Region Fiddles As Dam Burners Advance by James Buchal, January 3, 2005 "Judge Redden even struck down a rare Bush Administration initiative to reduce the fish taxes by roughly $60 million by reducing summer spill, notwithstanding proof that only a handful of endangered fish might benefit, including some of the same fish subject to a federally-approved harvest rate of over 30%"
ESA TODAY..Subject: Critical habitat proposed for Pacific Coast population of western snowy plover, Public comment accepted for 60 days, FWS 12/19/04. Snowy plover protection plan OKd, Oregonian 12/19/04. "The other 16 miles include "unoccupied" areas, where scientists believe the birds are most likely to establish new nests, Wright said." According to Coos County Commissioner John Griffith, "There's no shortage of plovers..."
KLAMATH: Feds agree to consider Endangered Species Act protection for lamprey, NCTimes 12/3/04. PRESS RELEASE: No Listing Decision for Sage-grouse Good News for Species Recovery, Committee on Resources 12/3/04. Study: Coastal coho sustainable, Capital Press 11/29/04. "In 1990, fewer than 20,000 wild coho returned for spawning in the 19 largest Coast Range basins. More than 240,000 returned in 2002, the peak of a resurgence credited to favorable ocean conditions, limited fishing in lean years and watershed restoration projects by the hundreds." Letter by Julie Smithson to the Forest Service regarding introducing and protecting wolves in Oregon. Like regarding our irrigation water in the Klamath Basin in 2001, pay attention! This nightmare will come to your town if you do not stop it. Oregon Cattlemen Association has asked Julie to distribute this information widely. Feds propose re-listing coho, Pioneer Press 10/20/04.Coho salmon comments for federal ESA re-listing are due Nov. 12. "A federal appeals court found that not all of the coho salmon were counted the first time." Lamprey: over $8million in 10 years for research, restoration, posted to KBC 10/19/04. As flow of salmon surges, US moves to cut protections, Boston.com posted to KBC 9/23/04. ''It's going to be difficult to justify taking out the dams with large numbers of fish coming back," said James J. Anderson, associate professor of aquatic and fishery sciences at the University of Washington. Shasta Tribal Chairman, Roy Hall, says that coho salmon are not native to the Klamath River system, Pioneer Press 9/01/04. ESA TODAY.OTHER PLACES: .Thomas names ESA hearing witnesses, casperstartribune.com 8/16/04. "While we toil in lawsuits about species' habitats, we have lost sight of the real motivation of this act -- the recovery of species." ESA TODAY OTHER PLACES: Shrimp Pose Big Problem for LAX, KTLA.com, 8/16/04. "Fish and Wildlife Service officials say they had no choice but to propose designating 5,800 acres in five Southern California counties as a preserve for the Riverside fairy shrimp." - ESA TODAY OTHER PLACES: Endangered Species Act needs revising, Modesto Bee 8/12/04, by Grover and Mayfield, Stanislaus County supervisors. Congressman Walden Shares Views with the NWRA on Improving Endangered Species Act July 20, posted to KBC 8/3/04. "...peer review and sound science. These are principles that we’ve used in developing research and health care, medicine, and in many other areas of science. It seems incredible to me that we don’t require that basic scientific principle in peer review in the decision as to whether or not a species is going to live or die; whether or not a community, economically, may live or die, based on the consequences of decisions." Thomas to chair endangered species field hearing, Casper Star Tribune 8/1/04. Mouse that Cost Economy $100 Million May Never Have Existed, Environment News 8/1/04. Letter to KBC: "I have a question, why cant "We the People" fire some of these jerks? Or just get rid of some of the agencies like the BLM? Do we still have the power? No probably not, but government is not run by the people and anyone who still thinks it is should take a harder look. Unless we all stand together against these agencies we wont have any free "public" lands or water for private lands. Good luck! Lisa...Washington." Speaking of "free 'public' lands", check out the following bills to lock up hundreds of thousands more acres in wilderness--no logging, mining, fire fighting (fried owls and boiled salmon), or any uses of resources. Go HERE. For scientist David Vogel's complete testimony, pdf file, go HERE. THE REAL SUCKERS ARE THE U.S. TAXPAYERS. Op-ed submitted to H&N by James Buchal, 7/21/04. JULY 17 Resources Committee ESA Hearing - Klamath Falls, for agenda and information, go HERE. ESA tragedy of today, July 8, 2004 Rumor today has it that, since the Klamath Basin has been forced to participate in a mandatory "voluntary" water bank with the threat of shutting down the Klamath Project if we don't idle land and pump our aquifer, wells are going dry. Lawsuits are beginning. Thank you government agencies for further damaging our community. Regardless of the "best available science", the National Academy of Science report saying that higher lake and river levels won't help fish, the BOR/NMFS are demanding 1/4 or our economy, our water, next year. What happened to "the best available science" line they gave us when they shut off our water in 2001? KBC. PLF Exposes Multi-Billion Dollar Endangered Species Act Cover-Up, Pacific Legal Foundation July 2004. "Billions of dollars spent each year on Endangered Species Act projects never get reported to Congress, according to an audit requested by PLF." Coho confusion continues, Pioneer Press 6/24/04. "On June 7, the listing of the Oregon coastal coho salmon to the federal Endangered Species Act was declared invalid. But on June 25, the Northern California coho may be listed to the California Endangered Species Act." Panel: Nature poses more risk to owls Some scientists find that logging is not the primary harm to habitat of the northern spotted owl Oregonian 6/23/04 "Natural events such as wildfires eliminated more forest habitat of the threatened northern spotted owl on public land during the past decade than logging did, researchers reported Tuesday...The science panel said logging of the owl's forest habitat poses less threat to the species than a decade ago, but other dangers including an influx of aggressive barred owls, disease and wildfires in overgrown forests make its survival uncertain." Scientists plan study of sturgeon, H&N 6/22/04 "Federal scientists plan to take another look at the status of the green sturgeon in the Klamath River and are asking for information about the ancient fish from the public. The new study will decide whether the fish needs to be listed for protection under the Endangered Species Act and comes as a result of a lawsuit filed by the Oregon Natural Resources Council, the Environmental Protection Information Center and the Center for Biological Diversity last year." U.S. Fish and Wildlife Service News Release, Critical Habitat Proposed for Washington's Coastal-Puget Sound Population of Bull Trout 6/22/04, followed by Critical Habitat Proposed for the Saint Mary and Belly Rivers in Northwest Montana: "The critical habitat proposal calls for a total of 2,290 miles of streams in western Washington to be designated as bull trout critical habitat, along with 52,540 acres of lakes and reservoirs and marine habitat paralleling 985 miles of shoreline." "The Service also proposed at that time to designate 396 miles of streams and 3,939 acres of lakes and marshes in Oregon as critical habitat for the Klamath River Basin population of bull trout. Those proposals are expected to be finalized in September 2004." Endangered Species' Cost USA Billions, cns news 6/22/04. "The FSW report did not take into consideration lost jobs, lost business, and lost tax revenues. If it did, the ESA would be rescinded within days. One famous example was the hoax about the "endangered" northern spotted owl. "At least 130,000 jobs were lost when more than 900 sawmills, pulp, and paper mills closed in mid-1990 to protect" the owl." Get serious about habitat and species protection, 6/22/04 The Oregonian, submitted to KBC by The Tri-County Courier. "Over the next 10 years we witnessed rural Oregon's economy bludgeoned in an effort to protect this species -- and others added to the list. Once-thriving communities turned into ghost towns while their schools and community services suffered tremendously because of high unemployment and lack of local tax revenue." PRESS RELEASE: Resources Committee to hold ESA Hearing on The Klamath Project, 6/21/04. Congressman Pombo: "The water shut-off in the Klamath Basin is a dramatic example of how, after 30 years, the Endangered Species Act has failed the species it was designed to recover. Unintended consequences have devastated communities." Jurassic fish will get closer examination, Times Standard posted to KBC 6/20/04, Followed by report regarding green sturgeon by NMFW and NOAA and comment deadline "A federal fisheries team will take another look at whether the green sturgeon -- an ancient denizen of West Coast rivers -- needs protection." ESA TODAY Petition Filed to Protect Siskiyou Mountains Salamander as Endangered Species, ONRC 6/17/04. ESA TODAY Group proposes three Oregon species for endangered species listing, 6/17/04 Newsregister.com. Hybrid owl upsets politics of threatened species, AP 6/21/04. ESA TODAY 'Endangered' Vermin That Cost America $100 Million Never Existed, NewsMax posted to KBC 6/13,04. Feds keep all ESA stocks listed, but upbeat about future, Fishletter 6/2/04. NOAA PRESS RELEASE: Agency Praises Regional Efforts to Protect Salmon through Habitat Projects and Hatchery Reforms, 5/28/04 "The National Oceanic and Atmospheric Administration's National Marine Fisheries Service(NOAA Fisheries) today announced its continued commitment to protect 27 Pacific salmon and steelhead populations listed under the Endangered Species Act (ESA)." Bush Administration Salmon Policy Puts Politics Before Science, the Law and People, Pacific Legal Foundation 5/28/04. "Pacific Legal Foundation criticized the Bush administration today for its proposed policy that would leave in place 26 Endangered Species Act (ESA) listings for salmon throughout the West, and add yet another listing, despite the fact that salmon are not at risk of extinction"
Feds back protecting wild runs of salmon, 5/15/04 The Oregonian, "The Bush administration is concerned about looking politically correct," said Darryll Olsen, with the Columbia-Snake River Irrigators Association. "The heart of the issue, at least in our mind, is how much impact does the mainstem hydro-system have on salmon fisheries at this time. We would say it is very minor. They are responding to political pressure." PRESS RELEASE: letter from NOAA, 5/14/04. NOAA says will likely relist w5 of 26 fish stocks under review, 5/14/04, cbbulletin. Endangered Species Act reconsidered 5/11/04, Bend Bulletin. "The Sound Science for Endangered Species Planning Act of 2003, sponsored by Rep. Greg Walden, R-Ore., would require a peer review of all scientific data used to evaluate endangered species." Tribes, others hope salmon can return over Oregon dams, Seattle Times 5/11/04 "Freeman wants to see hard scientific evidence salmon once spawned in the upper basin rather than relying on tribal histories -- an attitude that riles the tribes." Feds to announce de-listing decisions for eight fish esu's soon, 5/11/04 NW Fishletter. PRESS ALERT from House Committee on Resources: Pseudo environmental groups call on Bush administration to add 225 species to endangered list, 5/6/04, "...over the last 30 years only twelve species out of the 1304 species listed as endangered or threatened have been saved and those were not due to ESA. The peregrine falcon was saved by a private foundation and the American Eagle recovered when DDT was banned." Activists want 3 species listed, H&N 5/5/04. ESA TODAY, other places, Species act allies Cordoza with GOP; Bush supports (Modesto) Democrats efforts to change law, 5/4/04, chronicle washington bureau. "Particularly upsetting to Cardoza is the Fish and Wildlife Service's recent decision to designate 1.7 million acres in California and Oregon as critical habitat for the survival and restoration of vernal pool species....He said that if a species can be found across millions of acres it either can't be endangered or all that acreage can't be necessary to saving the species." For ESA TODAY page go HERE. Profile of Congressman Pombo, the champion of trying to improve the ESA, 5/3/04 sfgate.com and Chronicle Washington Bureau. West Coast farmed salmon to be counted in endangered species decisions, posted to KBC 5/2/04, from Congressman Doolittle's office. LEST WE FORGET 2001: Man, the endangered species, by Glenn Woiceshyn, May 1, 2001, Aynrand, regarding the Klamath Project shutoff. PRESS RELEASE: Bush Administration Contributes to Endangered Species Act Improvement Effort, 4/29/04, House Committee on Resources. Plan seeks to limit 'critical habitat' cases, Salt Lake Tribune 4/29/04. "The present system for designating critical habitat is broken," Craig Manson, the Interior Department's assistant secretary in charge of endangered species programs, told the House Resources Committee." Our posterity will laugh at us, Henry Lamb 5/2/04. Judge orders NOAA to complete listing reviews within 30 days, CB Bulletin 4/30/04. PRESS RELEASE: House Resource Committee, Critical Habitat Hearing Reveals Growing Consensus on Need for Modernization, "We've seen the effects of the Fish & Wildlife Service's questionable decision-making on critical habitat issues, causing unnecessary impacts to agriculture and other landowners, as well as to local governments and the economy. It cannot continue." ESATODAY ESA needs to be friendlier to people, by Bonner Cohen, National Center for Public Policy Research, posted to KBC 4/26/04: "In the 30 years since its enactment, the Endangered Species Act has emerged as one of the most powerful, and ineffective, environmental statutes on the books." ESATODAY Enviros propose motion to stop summer spill, 4/23/04, The NW Fishletter. "Coho fishing will also be allowed for the first time in 11 years off southern Oregon, with a 75,000-fish quota for the area. Wild coho stocks are building up and down the West Coast, but fishermen will only be allowed to keep hatchery fish with clipped adipose fins." ESATODAY Bull trout could lose federal protection status, Register Guard 4/14/04. American Rivers' top 10 list of "Most Endangered Rivers" is out. For the first time in 2 years, Klamath River is not on this list, The Oregonian 4/14/04. . HERE for story and list of endangered rivers. Agency estimates bull trout costs, The Oregonian, posted to KBC 4/9/04, "The cost of protecting the bull trout and its habitat in the Columbia and Klamath basins could reach $230 million to $300 million during the next 10 years, according to the U.S. Fish and Wildlife Service." From Oregon Congressman Walden's Office: Letters to Congressman Bonilla and Secretary of Agriculture Ann Venemon, posted to KBC 3/28/04, regarding the ESA listing of sage grouse. ESATODAY Key rules are eased to boost logging, Oregonian 3/24/04. HOPE FOR OREGON? Oregon has the highest unemployment in the United States. The Spotted Owl hoax, Klamath sucker hoax, etc, have decimated our economy. Bush hopes to relieve timber industry of spending millions of dollars searching for non-endangered species and to revive our economy.. Glen Spain, attorney-environmentalist-Pacific Coast Federation of Fishermen (PCFFA), plans to challenge it. ESATODAYFishermen want action to stop pinniped predation on chinook, CBB 3/19/04. The REAL fishermen are battling the ESA gone wacko also. When we met them last year, they support Klamath Farmers and we support them, despite what the green press would have you believe. The same environmentalists shutting down our agricultural industry are shutting down commercial fishing for them, even when they know salmon runs are fine. ESATODAY OTHER PLACES: NOAA Fisheries seeks more time in salmonid ESA listing review, CB Bulletin, posted to KBC 3/20/04. March 1, 2004, The Heartland Institute - "The Pombo legislation would add “sound science” requirements demanding peer-reviewed justification for listing new species. The new approach would also attempt to remove penalties for creating and maintaining endangered species habitat, replacing them with incentives and cooperative relations with federal agencies. His approach is being applauded by ESA analysts." Endangered Species Act endangers rights of landowners, www.townhall .com, posted to KBC 2/17/04. Bald eagle's range slows delisting as endangered, AP posted to KBC 2/17/04. "The bald eagle's territory...... stretches over much of the North American continent, with tens of thousands living in Alaska and British Columbia. The most recent survey in the contiguous United States counted nearly 6,500 nesting pairs in 2000 - up from just 417 in 1963." Congress likely to take up peer review in ESA reform effort, westernroundtable, posted to KBC 2/14/04. "A National Academy of Sciences review of the situation later determined the (Klamath 2001 water) shutoff was unnecessary." For the birds, Oregonian letter 2/23/04. "the state should focus on voluntary efforts and habitat restoration before it swings the hammer and forbids people to fly kites, run their dogs, build campfires and otherwise enjoy their beaches." Other places, same war: ESA causes water stewards to change roles, Capital Press-Idaho Staff Writer, 2/12/04. Feds seize family's ranch; Property owners fight government 'land grab', 2/10/04, New Mexico, WorldNetDaily. Klamath Basin is also on the wish list for 'wildland' designations. More salmon apparently not what they wanted, EatFirst 1/04. State OKs coho plan, 2/7/04. YREKA - "The listing of the coho salmon as a California Endangered Species became law on Wednesday to the disappointment of Siskiyou County's grassroots Save Our Shasta and Scott Valley communities (SOSS) organization that has worked for years to prevent it from happening." Congressman Walden's 2/4/04 statement on sound science before the House Subcommittee. PRESS RELEASE: Walden Testifies on Need for Endangered Species Act Reform, 2/4/04. "We learned from the NAS that the decisions made either weren't based on adequate science or were made by misinterpreting the data they had. In either case, more than 1,000 farm families didn't receive vital irrigation water and nearly two-dozen farmers went bankrupt. I pledged then and there to pursue changes in the ESA to require outside, independent peer review of the decisions made by the government when it comes to listing or delisting a species and in formulation of recovery plans." Disproved opinions driving assaults on Basin irrigation, H&N by Dr. Doug Whitsett. We are re-running this recent article. It seems appropriate today, 1/28. MORRISON: The case of the endangered jumping mouse, 1/27/04 Illinois Reader. "Wyoming had paid $61,430 to fund the study and the U.S. Fish and Wildlife kicked in an additional $20,000 and according to DNA results, these mice were not in short supply but were actually abundant." Smith seeks species act changes, 1/27/04 H&N. Walden said in a press release, "As we saw in the Klamath Basin, a scientifically unjustified decision not only brought widespread economic harm to an entire community, but also had the potential to harm the fish species on whose behalf the water-shut off was made." Smith press release. Walden press release. Steve Pedery of Water Watch said: "...peer review would take too long in most situations"
Species Act reform may be possible, Billings Gazette 12/29/03. 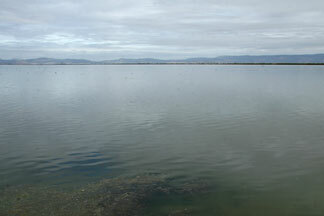 Endangered Species Act at work in Klamath basin, 12/28/03 by Peter B. Moyle and Jeffrey F. Mount. sacbee.com. "We found that in fact the higher lake levels and flows did not have a strong scientific basis, at least for protecting the listed species." RESPONSE to the Dec 28th opinion article in the Sacramento Bee, 12/28/03 entitled, "Endangered Species Act at work in Klamath basin", by Pat Ratliff, Malin, Oregon. "As a landowner in the Klamath Basin let me say, very few of the stakeholders have ever been to the table, and I dare say, never will be. From the smallest tributary north of Klamath Lake to the last landowner at the coast, the *people* who live on this land are given little chance of interaction with those who you so accurately describe as the "players"
Response by Steve Cheyne, Klamath Falls 11/26/03 "Biologists and conservation organizations, as well as government bureaucracies, have done a remarkably efficient job of making enemies of the people they need to befriend in order for significant conservation work to proceed. Keep in mind that a farmer or rancher who is in a profitable economic situation will be far better able to spend some money on conservation and apply for some grant money if critical habitat designations were not so onerous." Andy Kerr, 'Don't try to improve grazing, abolish it', outlines how he and the environmental groups will litigate to break the ranchers.
" Better grazing is also boring to work on. Abolition is much more interesting." "We must make it more expensive for elite welfare ranchers. On forests west of the Cascades, the timber industry used to expend X amount of effort for Y amount of timber. Today, while they still aren't run off the public forests within the range of the Northern spotted owl, they do have to spend 10 times the effort for maybe one-tenth of the timber." Kerr tells how the ONRC are using the ESA to end timber, and tells which species they plan to use to reach their goals. Species Protection Act 'Broken', LA Times, posted to KBC 11/17/03. "A top Interior official says the law should be revised to give economic and other interests equal footing with endangered animals and plants." Restricted water flow stops Mississippi barge traffic, 9/4/03, Illinois Conservative Politics. " 'I am also concerned about the environment, but cutting the flow does nothing for the birds that have already gone and it hurts the economy. Most people don’t understand the value of the navigation that we have here in the Midwest and the necessity of reliable flows.' said Huffman. 'The barge industry suffers approximately $500,000 a day loss when they run at reduced efficiency but $1,000,000 a day when the rivers are completely closed to navigation.' "
Species recovery good for Colorado, May 2003, Rocky Mt News.com. Walcher: "Congress adopts this incredibly strong law and then puts essentially no resources into it. U.S. Fish and Wildlife put them on the list and it's everyone else's problem to deal with. And so, then, the discussion inevitably is about land management, whether or not to let a ski area expand, whether to close a road, or ban snowmobiles, or stop logging, or stop oil and gas, or stop this or stop that. No one gets back to the question of how we're going to restore a species; regulating the habitat by itself doesn't accomplish that"